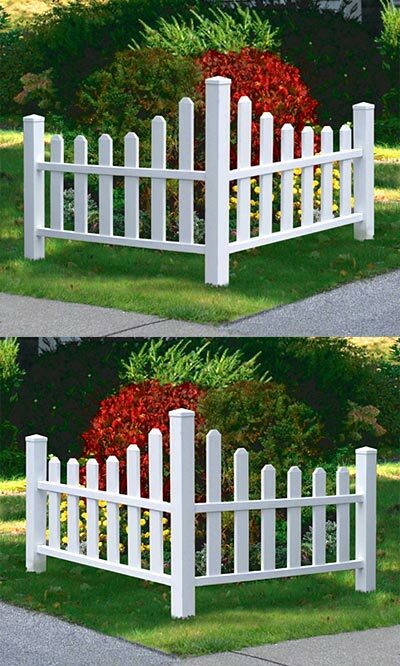 Adorn two corners of your yard with dramatic fencing using these New England Country Corner Picket Fences. This pack of two corner fence sections allows you to flank your driveway or encircle a large tree, for an eye-catching look in your yard in moments. The white color of each unit ensures a crisp look in your yard, and the all vinyl construction creates a lasting adornment. The square support posts on each section sport slightly pointed endcaps, while the interior pickets and horizontal slats complete the traditional shape. A locking tab on the bottom of each picket rail keeps it in place, for a sturdy and lasting fence, and the 90° angle of each piece lends strong geometry to your yard. The square posts install in soil for final placement, and can be secured with concrete (not included) for stability and strength. The vinyl body will remain lovely for years of use, without yellowing, warping, or rotting, and cleans in moments with just a rinse from your garden hose. Add a bit of traditional style to the corners of your yard or garden with these Country Corner Picket Fences. Twenty year warranty. Assembly required. Note: This case pack includes 2 of the New England Country Corner Picket Fences, 43"H.